This granite and bronze monument is known well to runners and walkers who enter its terrace stairway to the Reservoir at Fifth Avenue and 90th Street. 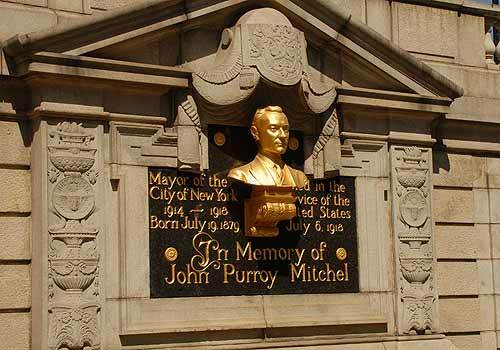 The monument honors John Purroy Mitchel, who became New York City's youngest mayor in 1913 and was credited for ferreting out Tammany Hall corruption. He presided over the opening of the first water tunnel in 1917, which is the reason his memorial is on the Reservoir site. After his failed re-election bid, Mitchel enlisted in World War I to serve in the Army aviation corps in 1918. He was killed only months later when he fell 500 feet from his plane during a training flight. Dedicated in 1928, the memorial's expansive granite stele was designed by architects Thomas Hastings and Don Barber. German-born sculptor Adolph Alexander Weinman created the former mayor's gilded bronze portrait bust. The Conservancy conserved the monument in 1986 and regilded the sculpture in 1998. Engineers' Gate entrance to the Park at 90th street and Fifth Avenue.